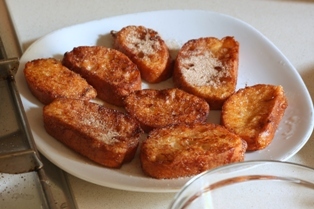 This Brazilian cinnamon french toast has been present in all my Christmas lunches and dinners since now. It has always been my mother’s favorite Christmas sweet and usually she is the one who prepares it. The recipe may lightly vary between different families – and it is just a reason to compare one to another like “mine is softer”, “mine is sweeter”, and so on ;-). 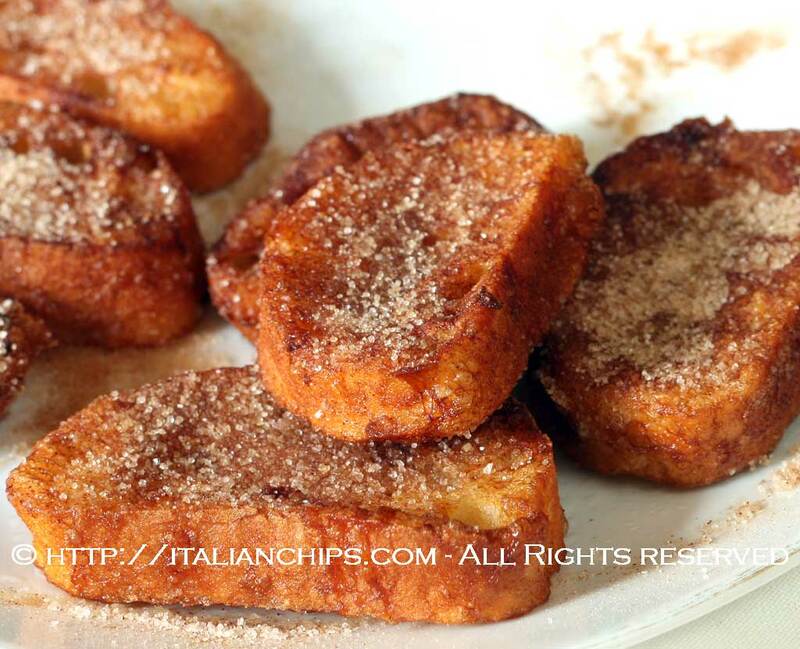 It is one of those old simple recipes that pleases all just because, being simple, contains just a few genuine ingredients that everyone usually eats (bread, milk, eggs, sugar and cinnamon). And, as it happens often, the result is something we just can’t stop eating ;-). My mother defends the original tradition that wants these Christmas french toasts to be fried. She says it releases a kind of “sauce” that makes the difference. My sister prepares it in the oven. Which is the best? I tried both and…I really can’t say which is the best- I like both the same way. So it’s up to you if to fry or just bake them. I added step by step photos, even if it is really so much simple to prepare. Cut the bread in slices. Lightly beat a couple of eggs and put milk in another plate. Dip each slice first into the milk and then into the eggs. If you decide to bake them, put them on an oven tray covered with parchment paper and bake them in pre heated oven at 180°C/356°F until lightly colored. Otherwise fry them in abundant boiling oil. PAY ATTENTION: do not touch them while frying and turn them upside down only once – this will prevent them from absorbing oil. 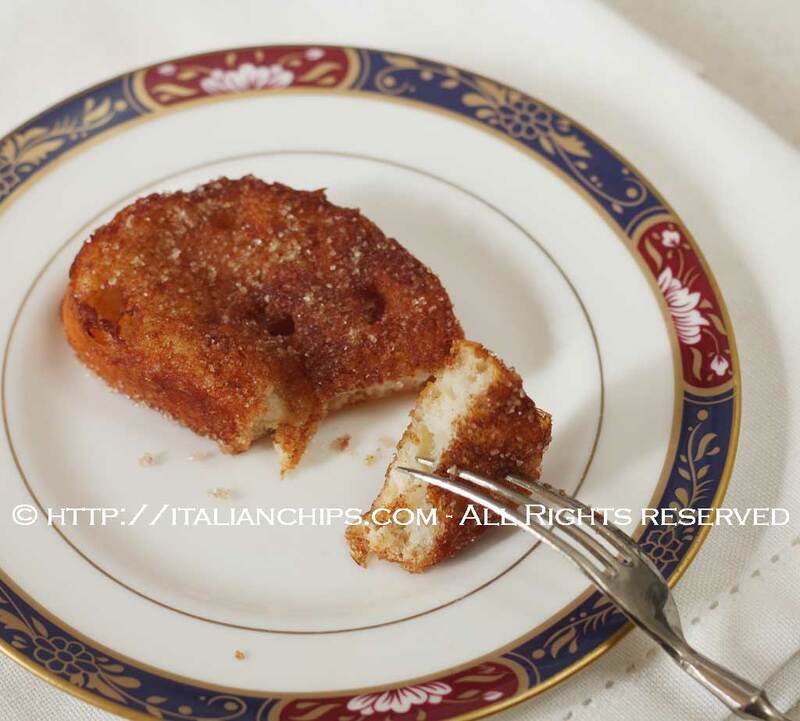 As soon as you take them out of the oil, sprinkle sugar and cinnamon you have previously mixed in a small bowl. Pass each one into milk and then onto beaten eggs. 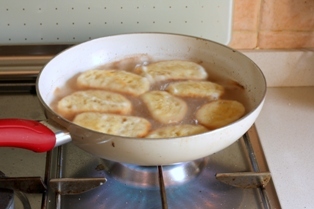 Bake or fry in boiling oil. Sprinkle sugar and cinnamon and serve.